So far we have discussed only those instruments and materials you will need for drawing straight lines (with the exception of French curves). Many drawings you prepare will require circles and circular arcs. 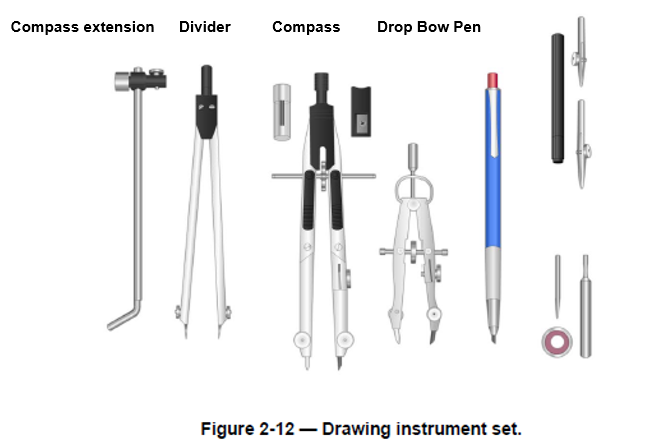 Use instruments contained in a drawing instrument set (Figure 2-12) for this purpose. Many types of drawing instrument sets are available; however, it is sometimes difficult to judge the quality of drafting instruments by appearance alone. Often their characteristics become evident only after use. The following sections describe these instruments as well as some special-purpose instruments not found in the set. These special-purpose instruments may be purchased separately or found in other instrument sets.